Do I really need a grow tent? Probably the very first question that an indoor gardener will ask herself is where can I grow my plants? Since most plants grow best at a specific temperature and humidity range as well as under specific periodic bright lighting arrangements, a designated enclosed space is needed if you want your plants to grow undisturbed to their fullest potential. If you have the space available, you can allocate a room to become ​a grow room. If, like most of us, you don’t happen to have a spare room just lying around, then the next best option is ​a grow tent. Grow tents offer a convenient and practical way to create the perfect environment for your plants, allowing you to control things like temperature, humidity and light precisely, thereby optimising plant growth. They also have the added benefit of isolating the growing environment away from anyone else in the vicinity so that they are not disturbed by conditions in the growing environment such as ​the intense LED lighting. In this article, we first look at grow tents in detail and what to look for when buying one, before moving on to some of the grow tent accessories that are necessary to complete the growing set-up. Ok so I need a grow tent, what should I be looking for? 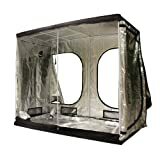 ​There are several factors that are important to look at when purchasing a grow tent. ​It is important for your plants to have enough headroom for them to grow, so you really need to know how they will perform beforehand so that you can get the right size tent to keep them healthy and maximise yield. Importantly when calculating the size of ​a growing tent, you will also need to take into account the minimum distance away from the grow light that the plant canopy needs to stay in order to remain healthy. 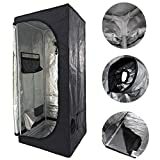 You don't want your plants growing into the lamps and then dying off due to the excessive heat given off by them by having too small a grow tent. ​Incidentally, if you are using LED grow lights which generate much less heat, the plants can grow much closer to the light source than with other types of lighting such as HID lamps. Generally speaking though, when choosing a grow tent, taller is better (as long as your room ceiling is high enough to accommodate it) with the added advantage that you won’t have to squat down as much to access you plants with taller grow tents. ​Thickness of the grow tent fabric is a factor in how robust the growing tent is and how long it will last. In addition, the thicker the material, the less light, odours and noise will escape from the grow tent. Thickness is usually given in Denier (D). The higher the Denier number, the thicker the material fabric and generally the higher the quality of the grow tent. The most common thicknesses available are 1680D, 600D, and 190D. Grow tents with a fabric thickness of 1680D can be rather expensive whereas those with a thickness of 600D often represent the right balance between recommended thickness and price. ​There are several things to keep in mind here. First and foremost, is the frame. This can be made out of plastic or metal. Generally speaking, metal frames are better, and the thicker the poles, the more sturdy the tent. In addition, the corner brackets that hold the frame together ideally should be made of metal although plastic ones will suffice but will have a shorter life. The final durability characteristic to look out for are the zippers. The zippers zip-close the access points to the grow tent and these need to be of high quality as you will be regularly opening and closing the tent. If you have been unlucky enough to have a zipper break, then you will know how difficult it can be to keep the light, odour and noise completely isolated from the outside environment without a functioning zipper. ​For the inner lining of the grow tent, you generally have 2 choices: Silver Mylar or a white surface. Silver Mylar provides a better reflective surface than white-lined tents and since heat is rarely a problem with LED lighting, this is the recommended lining of choice for your grow tent. However, Mylar-lined tents can get excessively hot if grow lamps other than LED grow lights (eg. HID lamps) are used, so white-lined tents will perform better when using traditional grow lighting. Spillage Protection: Ideally the growing tent will have a waterproof floor covering or tray to protect against accidental spillages, which happens to almost everyone at some point. The spill tray in a grow tent is also especially important when working with hydroponic systems, since blockages and other mishaps can lead to nutrient solution overflow. Fortunately, ​a lot of grow tents today come with a spillage tray included as part of the grow tent kit. ​Black Orchid Hydro-box grow tents ​​represent one of the best grow tent brands that are available to the UK consumer. They consist of a metal frame held together by metal push-fit corners ​and come with metal hanging bars at the top to which grow lights can be securely attached. 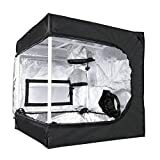 This is unlike cheaper, less well-made grow tents available in the UK where the frame and the corner attachments may be made of less durable plastic. In addition, Black Orchid grow tents are covered by a high-quality fabric lined on the inside with diamond-patterned Mylar and which is all fastened together using high-quality zippers. The tents are equipped with ​multiple large openings for fans and carbon filters as well as smaller entry points for cables, all of which are made light-proof via the use of two layers of drawstrings that work very well to keep light from either entering or exiting the grow tent. It should be noted that the walls of the grow tent are not rigid but are of soft fabric, so one should expect their new grow tent, when first set up, to look quite creased, especially after having sat in packaging for a while, and it will not look as neat and tidy (and rigid!) as in the advertised pictures. One other nice touch from Black Orchid is that their growing tents come with a removable spill tray that is useful in protecting sensitive flooring. ​On a slightly more negative note, new owners of Black Orchid grow tents in the UK have reported that some packages do not contain any assembly instructions. However, this is merely a minor annoyance as setting up a grow tent is not rocket science and most people will have no trouble figuring out how to put it together without any written help. Another issue some users may dislike is that although discreet brown box packaging is used for delivery, less than discreet information about the grow tent is visible on the outside of the packaging. ​Overall, Black Orchid grow tents have a well thought out design and are good value for money that most UK growers will find invaluable in their growing setups. Black Orchid offer a wide range of grow tent sizes catering to almost all types of indoor growers and all types of growing installations in the UK. Growers purchasing Black Orchid grow tents for the first time will surely not be disappointed! So you finally have your swanky new grow tent, you've assembled it together with the grow light that you've purchased after reading all (ok, ok, SOME) of our other stuff on LED grow lamps, ​and now you're itching to position your plants inside the grow tent and set it on its way. But not so fast! ​In addition to the LED lighting and grow tent, you are also going to need ​some ​other grow tent accessories ​that ​will be essential tools for keeping your plants healthy and vibrant throughout the growing cycle. One of the most important is a ventilation ​kit for the grow tent which generally consists of ducting, an inline extractor fan and a carbon filter. ​A question new growers often ask is "do grow tents need ventilation?" - and the answer to that is absolutely. The ventilation system serves two functions: first, it changes the air within the grow tent to keep it fresh, mostly to keep a consistent supply of CO​2 for the plants to use, and secondly, it removes excess heat. You can get away without a ventilation system in a grow tent with very few plants (assuming you are using LED lights or CFL lighting​) ​but in ​grow tents with lots of plants or with more traditional forms of grow lighting, a ventilation system is essential. If a ventilation system is not used, plant growth may be inhibited by inadequate CO​2 levels and increased temperatures or increased humidity, all of which are sub-optimal for plant growth (assuming the plants survive in the first place!). And to really top it off, increased temperature and humidity within ​a growing tent can also lead to mould formation and plant rot, stuff you definitely don't want going on in your grow tent. Ventilation systems come in several different ‘sizes’ to cater to the different-sized growing tents and you will need to identify the system that will work effectively for your particular grow tent. In order for a ventilation system to be effective, it will need to completely change the air within the grow tent, at the very least, every 3 minutes or 20 times per hour in order to keep the CO​2 that plants need at optimal levels. However, you will want a ventilation system that can do much more than that in order to remove the excess heat given off by the grow lighting, especially if more traditional forms of grow lighting are used. 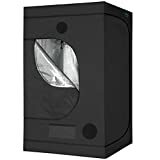 The carbon filters are necessary to prevent the odours from the plants and growing media from entering the room housing the grow tent but they are only important if you are venting the air of the grow tent directly into the room. However, if the grow tent is to be vented to the outside (assuming you are not annoying the neighbours with the exhaust), then the filter becomes unnecessary, although in the UK we don't always have the luxury of easily installing an external vent. An intake fan can also be installed to force fresh air into the grow tent but in many cases, it is unnecessary if your extractor fan is working optimally as the negative pressure created by air extraction will force air into the tent via the intake openings, unless of course you have a large grow tent. The extraction ducting ​is best positioned so that air is extracted from the top of the grow tent to remove warm air first. The fresh air intake openings should be positioned on the opposite side, towards the bottom of the grow tent, so that fresh air flows up through the plant canopy towards the exit. Another important accessory is a temperature sensor which is essential to make sure that your plants stay within their optimal temperature range. This is especially important if you end up using grow lamps such as HID lighting that generate a lot of heat. If you have a household thermometer that you can position within the grow tent, then that should suffice but these days for a few pounds, you can get an all-singing, all dancing digital sensor which also provides you with humidity data that you need for optimal plant growth. ​For ​best plant vegetative growth, the temperature target range in the grow tent that you will be aiming for will be ​21​℃ -28℃. As for humidity, you are looking for a relative humidity (RH) of 50%-80% as the target range. ​Black Orchid (reviewed ​earlier) is not only a well-known brand in the grow tent arena, but they are also active in the hydroponic / indoor-grow ​accessories ​area in general and they have a useful temperature and humidity meter specifically designed for us indoor gardeners (see picture). Another piece of equipment that you will be hard pressed to do without is a timer switch. For LED grow lighting, your bog-standard timer switch should be fine to use. One of our favourites is the Silverline Plug-In Mechanical Timer (see picture on the left) due to its simplicity, excellent value, and most of all, its lack of noise, unlike many other brands of timers that can produce an incessant clicking noise. However, LED grow lighting is not yet used by everyone so it is important to mention that with HID lighting, you should NOT use your normal timer switch that you might have lying around the house because it has not been built for such high loads. A timer switch specifically designed for HID lighting (such as the one in the picture on the right) is essential. Here at LEDgrowLightsHQ, we have pages dedicated to most of these requirements including seeds and propagation information, seed starter media, and the different types of hydroponics equipment available, and we have already discussed previously (see above) grow tents and the grow tent accessories that are needed when setting up a grow area. However, going through each piece of equipment and determining whether it will work nicely with other components of your grow setup can be time-consuming and challenging.